Ancient Buddhist cave in Jalalabad, Afghanistan. Buddhism in Afghanistan was one of the major religious forces in the region during pre-Islamic era. The religion was widespread south of the Hindu Kush mountains. Buddhism first arrived in Afghanistan in 305 BC when the Greek Seleucid Empire made an alliance with the Indian Maurya Empire. The resulting Greco-Buddhism flourished under the Greco-Bactrian Kingdom (250 BC-125 BC) and the later Indo-Greek Kingdom (180 BC - 10 AD) in modern northern Pakistan and Afghanistan. 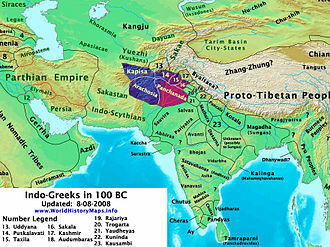 Greco-Buddhism reached its height under the Kushan Empire, which used the Greek alphabet to write its Bactrian language. Lokaksema (c. 178 AD), who travelled to the Chinese capital of Luoyang and was the first translator of Mahayana Buddhist scriptures into Chinese, and Mahadharmaraksita who, according to the Mahavamsa (Chap. XXIX), led 30,000 Buddhist monks from "the Greek city of Alasandra" (Alexandria of the Caucasus, around 150 km north of today's Kabul in Afghanistan), to Sri Lanka for the dedication of the Great Stupa in Anuradhapura. The Greco-Bactrian King Menander I, (Pali) "Milinda," ruled 165 BC - 135 BC, was a renowned patron of Buddhism immortalized in the Buddhist text the Milinda Panha. The famous Persian Buddhist monastery in Balkh in northern Afghanistan, known as Nava Vihara ("New Monastery"), functioned as the center of Central Asia Buddhist learning for centuries. The Buddhist religion in Afghanistan started fading with the arrival of Islam in the 7th century but finally ended during the Ghaznavids in the 11th century. 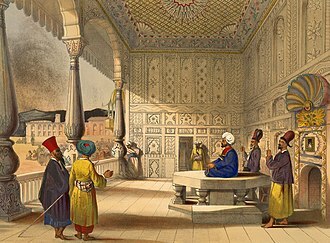 The territory within the borders of Afghanistan has seen many cultural and religious shifts over the centuries. The geographical position of the area between the Middle East, South Asian, and Central Asian cultures, and the proximity to the famous Silk Road (connecting East Asian and Mediterranean civilizations, and others in between), have been major drivers of local historical and cultural developments. One major influence was the conquest of the area by Alexander the Great, which incorporated the area for a time into the Hellenistic World, and resulted in a strong Hellenistic influence on Buddhist religious art in that region. In 305 BC, the Seleucid Empire made an alliance with the Indian Maurya Empire. The Mauryans brought Buddhism from India and controlled the area south of the Hindu Kush until about 185 BC when they were overthrown. At the time of these developments, most of the area belonged to the kingdoms of Bactria and Sogdiana, including the Scythians, followed Buddhism until the arrival of Islam. 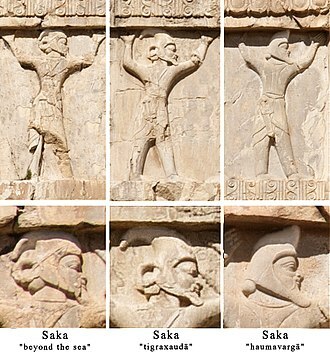 Many monuments testify to the Buddhist culture in present-day Afghanistan. Greek cultural and artistic influence in the region can be researched under Buddhist art and Greco-Buddhism. Additional historical detail can be researched under Pre Islamic Hindu and Buddhist heritage of Afghanistan and Hinduism in Afghanistan. Soon after the Sassanian Persian dynasty fell to the Muslims (in 651 AD), the Nava Vihara monastery in Balkh came under Muslim rule (in 663 AD), but the monastery continued to function for at least another century. In 715 AD, after an insurrection in Balkh was crushed by the Abbasid Caliphate, many Persian Buddhist monks fled east along the Silk Road to the Buddhist Kingdom of Khotan, which spoke a related Eastern Iranian language, and onward into China. 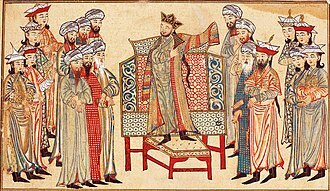 Nava Vihara's hereditary administrators, the Persian Barmakids, converted from Buddhism to Islam after the monastery's conquest and became powerful viziers under the Abbassid caliphs of Baghdad. The last of the family's line of viziers, Ja'far ibn Yahya, is a protagonist in many tales from the Arabian Nights. 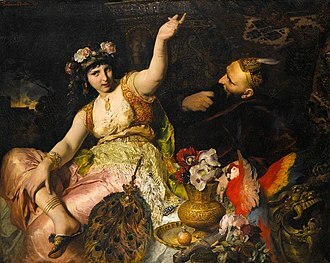 In folktales and popular culture Ja'far has been associated with a knowledge of mysticism, sorcery, and traditions lying outside the realm of Islam. The Buddhist religion survived the Islamic conquest of Afghanistan by the Umayyads and rule by the Abbasid Caliphate. Buddhism in Afghanistan was effectively removed by the Saffarids, Ghaznavids, and Ghurids. Manuscript fragment of the Buddhist Jatakamala, Sanskrit, language in the Gilgit-Bamiyan-Type II Protosarada script, Toyuk, probably 8th-9th century - Ethnological Museum, Berlin. In August 2010, it was reported that approximately 42 Buddhist relics have been discovered in Mes Aynak of the Logar Province in Afghanistan, which is south of Kabul. Some of these items date back to the 2nd century according to Archaeologists. Some Buddhist sites were found in Ghazni. The items in Logar include two Buddhist temples (Stupas), Buddha statues, frescos, silver and gold coins and precious beads. There is a temple, stupas, beautiful rooms, big and small statues, two with the length of seven and nine meters, colorful frescos ornamented with gold and some coins... Some of the relics date back to the fifth century (AD)... We have come across signs that there are items maybe going back to the era before Christ or prehistory... We need foreign assistance to preserve these and their expertise to help us with further excavations. Two rare Jain bronze relics have been found in Afghanistan. The 3rd/4th century c.e. 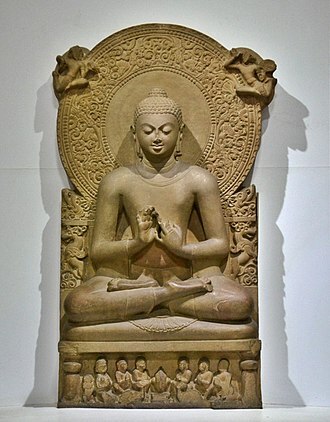 Jain text Vasudevahindi mentions Jain merchants travelling overseas to Java, China and central asia. Two additional Jain images have been reported in Afghanistan, a marble Padmasan image, and an image in the private collection of the king. ^ Berzin, Alexander (December 2006). "History of Buddhism in Afghanistan". Retrieved June 5, 2016. ^ Nancy Hatch Dupree / Aḥmad ʻAlī Kuhzād (1972). 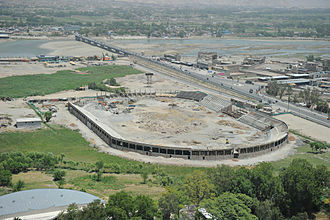 "An Historical Guide to Kabul – The Name". 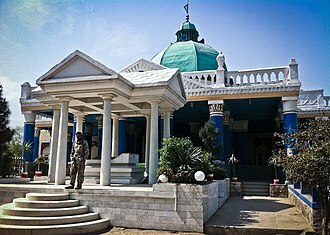 American International School of Kabul. Archived from the original on August 30, 2010. Retrieved September 18, 2010. ^ Amy Romano (2003). A Historical Atlas of Afghanistan (illustrated ed.). The Rosen Publishing Group. 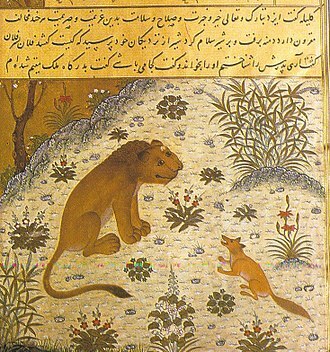 p. 25. ISBN 0-8239-3863-8. Retrieved 18 September 2011. ^ Steven Otfinoski (2004). Afghanistan (illustrated ed.). Infobase Publishing. p. 6. ISBN 0-8160-5056-2. Retrieved 18 September 2011. ^ "42 Buddhist relics discovered in Logar". Maqsood Azizi. Pajhwok Afghan News. Aug 18, 2010. Archived from the original on 2010-03-17. Retrieved 2010-08-23. ^ "Afghan archaeologists find Buddhist site as war rages". Sayed Salahuddin. News Daily. Aug 17, 2010. Archived from the original on 2010-08-18. Retrieved 2010-08-16. 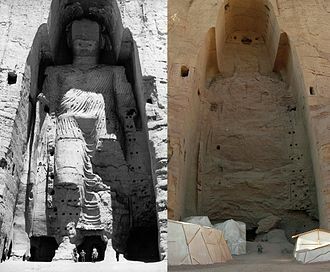 ^ "Buddhist remains found in Afghanistan". Press TV. Aug 17, 2010. Retrieved 2010-08-16. Wikimedia Commons has media related to Buddhism in Afghanistan. The Ruwanwelisaya is a stupa in Sri Lanka, considered a marvel for its architectural qualities and sacred to many Buddhists all over the world. It was built by King Dutugemunu c.140 B. C. who became lord of all Sri Lanka after a war in which the Chola King Elara, was defeated and it is known as Mahathupa, Swarnamali Chaitya, Suvarnamali Mahaceti and Rathnamali Dagaba. This is one of the Solosmasthana and the Atamasthana, the stupa is one of the worlds tallest monuments, standing at 103 m and with a circumference of 290 m. The Kaunghmudaw Pagoda in Sagaing, Myanmar is modeled after this stupa, the stupa was an ancient ruin in the 19th century. After fundraising efforts by Sinhalese bhikkhu, the stupa was renovated in the early 20th century, the Ruwanveli Seya Restoration Society was founded in 1902 and the final crowning of the stupa took place on 17 June 1940. The largest Stupa after Ruwanwelisaya was build in was the Kotmale Mahaweli Maha Seya and this stupa took 33 years and 3 months to complete. King Dutugemunu began the work of building the stupa during Vesak, on the day of the month of Vesakha. Then he had mercury, resin of the wood-apple, and fine clay mixed together, had spread over the slabs of stones. He had arsenic and sesame oil mixed together, had spread over the bronze sheets. When the king had built and completed the foundation of the Great Stupa. He had Anuradhapura decorated like a city along with the terrace of the Great Stupa. The Arahant Indagutta arranged that it should thus happen, when Arahant Siddhattha saw the minister walking thus around the relic-chamber and measuring too large dimensions, he ordered him to measure moderate ones. He had eight large water pots of gold and eight of silver placed in the midst of the Great Stupa and he had, eight bricks of gold placed in eight corners and a hundred and eight bricks of silver around each of the bricks of gold. Arahant Cittasena placed a lump of fragrant resin in the east side upon the line drawn around the Great Stūpa. Buddhism in Central Asia refers to the forms of Buddhism that existed in Central Asia, which were historically especially prevalent along the Silk Road. The history of Buddhism in Central Asia is closely related to the Silk Road transmission of Buddhism during the first millennium of the common era, a number of Early Buddhist schools were historically prevalent throughout Central Asia. Therefore, most countries which adopted Buddhism from China, adopted the Dharmaguptaka vinaya and ordination lineage for bhikṣus, warder, in some ways in those East Asian countries, the Dharmaguptaka sect can be considered to have survived to the present. Warder further writes, It was the Dharmaguptakas who were the first Buddhists to establish themselves in Central Asia and they appear to have carried out a vast circling movement along the trade routes from Aparānta north-west into Iran and at the same time into Oḍḍiyāna. D. The Mahīśāsakas and Kāśyapīyas appear to have followed them across Asia into China, for the earlier period of Chinese Buddhism it was the Dharmaguptakas who constituted the main and most influential school, and even their Vinaya remained the basis of the discipline there. The Kushan empire would adopt the Greek alphabet, Greco-Buddhist art forms and coinage, the first anthropomorphic representations of the Buddha himself are often considered a result of the Greco-Buddhist interaction. Before this innovation, Buddhist art was aniconic, the Buddha was only represented through his symbols, probably not feeling bound by these restrictions, and because of their cult of form, the Greeks were the first to attempt a sculptural representation of the Buddha. In India as well, it was natural for the Greeks to create a single common divinity by combining the image of a Greek God-King. When King Kanishka came to power in 78 AD in Central Asia a new system of chronology was adopted, during the Kushan period, various religious systems were widespread in Central Asia. These were the cult of Mitra and Anahit, Zoroastrian pantheon the Greek pantheon. The followers of Buddhism had been banished from Iran in the 2nd - 3rd centuries and found support in Central Asia, during the archeological excavations in Khorezm and Sogd it was found out that many settlements and castles dated back to the Kushan period. But the largest number of traces of Buddhist culture during the Kushan period was found in Tolharistan, architectural fragments dating back to the Kushan period have been found in Old Termez. Some Buddhist monuments date back to the period of the Great Kushans and they promoted both Hīnayāna and Mahāyāna scriptures. 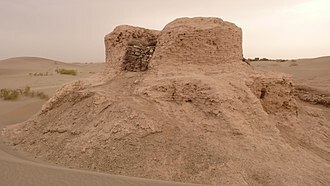 The ancient Kingdom of Khotan was one of the earliest Buddhist states in the world and its capital was located to the west of the modern city of Hotan. The inhabitants of the Kingdom of Khotan, like those of early Kashgar and Yarkand, available evidence indicates that the first Buddhist missions to Khotan were carried out by the Dharmaguptaka sect. Now all other manuscripts from Khotan, and especially all manuscripts written in Khotanese, belong to the Mahāyāna, are written in the Brāhmī script, in Khotan, there were numerous Hīnayānists who attempted to prevent it because they regarded the text as heterodox. Eventually, Zhu Shixing stayed in Khotan, but sent the manuscript to Luoyang where it was translated by a Khotanese monk named Mokṣala, in 296, the Khotanese monk Gītamitra came to Changan with another copy of the same text. Bactria or Bactriana was the name of a historical region in Central Asia. Bactria was located between the Hindu Kush mountain range and the Amu Darya river, covering the region that straddles modern-day Afghanistan and Tajikistan. The English name Bactria is derived from the Ancient Greek, Βακτριανή, analogous names include the Pashto and Persian, باختر‎, translit. Bākhtar‎, Uzbek, Балх, Tajik, Бохтар, Chinese, 大夏, pinyin, Dàxià and this region played a major role in Central Asian history. At certain times the political limits of Bactria stretched far beyond the frame of the Bactrian plain. 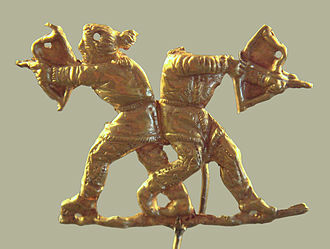 The Bactria–Margiana Archaeological Complex is the modern designation for a Bronze Age culture of Central Asia. 2200–1700 BC, located in present-day eastern Turkmenistan, northern Afghanistan, southern Uzbekistan and western Tajikistan, centred on the upper Amu Darya and its sites were discovered and named by the Soviet archaeologist Viktor Sarianidi. The early Greek historian Ctesias, c.400 BC, alleged that the legendary Assyrian king Ninus had defeated a Bactrian king named Oxyartes in ca.2140 BC, or some 1000 years before the Trojan War. Since the decipherment of cuneiform in the 19th century, according to some writers, Bactria was the homeland of Indo-Iranian tribes who moved south-west into Iran and into north-western India around 2500–2000 BC. Later, it became the province of the Persian Empire in Central Asia. It was in these regions, where the soil of the mountainous country is surrounded by the Turanian desert. After Darius III had been defeated by Alexander the Great, the satrap of Bactria, Bessus attempted to organise a resistance but was captured by other warlords. He was tortured and killed, however, in the south, beyond the Oxus, he met strong resistance. After two years of war and an insurgency campaign, Alexander managed to establish little control over Bactria. After Alexanders death, Diodorus Siculus tells us that Philip received dominion over Bactria, at the Treaty of Triparadisus, both Diodorus Siculus and Arrian agree that the satrap Stasanor gained control over Bactria. 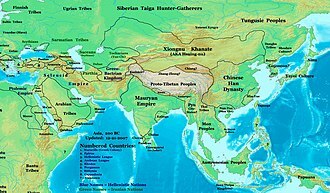 Eventually, Alexanders empire was divided up among the generals in Alexanders army, Bactria became a part of the Seleucid Empire, named after its founder, Seleucus I.
Mahayana is one of two main existing branches of Buddhism and a term for classification of Buddhist philosophies and practice. The Buddhist tradition of Vajrayana is sometimes classified as a part of Mahayana Buddhism, a bodhisattva who has accomplished this goal is called a samyaksaṃbuddha, or fully enlightened Buddha. A samyaksaṃbuddha can establish the Dharma and lead disciples to enlightenment, Mahayana Buddhists teach that enlightenment can be attained in a single lifetime, and this can be accomplished even by a layperson. The Mahāyāna tradition is the largest major tradition of Buddhism existing today, with 53. 2% of practitioners, major traditions of Mahāyāna Buddhism today include Chan Buddhism, Korean Seon, Japanese Zen, Pure Land Buddhism, and Nichiren Buddhism. It may include the Vajrayana traditions of Tiantai, Shingon Buddhism, and Tibetan Buddhism, according to Jan Nattier, the term Mahāyāna was originally an honorary synonym for Bodhisattvayāna — the vehicle of a bodhisattva seeking buddhahood for the benefit of all sentient beings. The term Mahāyāna was therefore formed independently at a date as a synonym for the path. The earliest Mahāyāna texts often use the term Mahāyāna as a synonym for Bodhisattvayāna, the presumed dichotomy between Mahāyāna and Hīnayāna can be deceptive, as the two terms were not actually formed in relation to one another in the same era. Among the earliest and most important references to the term Mahāyāna are those that occur in the Lotus Sūtra dating between the 1st century BCE and the 1st century CE. Seishi Karashima has suggested that the term first used in an earlier Gandhāri Prakrit version of the Lotus Sūtra was not the term mahāyāna, the origins of Mahāyāna are still not completely understood. The earliest Western views of Mahāyāna assumed that it existed as a school in competition with the so-called Hīnayāna schools. The earliest textual evidence of Mahāyāna comes from sūtras originating around the beginning of the common era. There is no evidence that Mahāyāna ever referred to a formal school or sect of Buddhism, but rather that it existed as a certain set of ideals. Membership in these nikāyas, or monastic sects, continues today with the Dharmaguptaka nikāya in East Asia, Mahāyāna was never a separate rival sect of the early schools. Paul Harrison clarifies that while monastic Mahāyānists belonged to a nikāya, from Chinese monks visiting India, we now know that both Mahāyāna and non-Mahāyāna monks in India often lived in the same monasteries side by side. 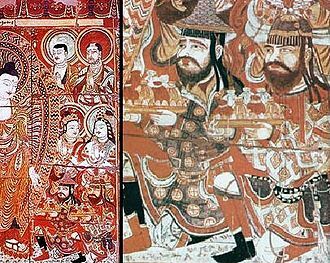 Those who venerate the bodhisattvas and read the Mahayana sūtras are called the Mahāyānists, much of the early extant evidence for the origins of Mahāyāna comes from early Chinese translations of Mahāyāna texts. These Mahāyāna teachings were first propagated into China by Lokakṣema, the first translator of Mahāyāna sūtras into Chinese during the 2nd century CE. Guang Xing states, Several scholars have suggested that the Prajñāpāramitā probably developed among the Mahāsāṃghikas in southern India, in the Āndhra country, warder believes that the Mahāyāna originated in the south of India and almost certainly in the Āndhra country. The Kingdom of Khotan was an ancient Iranic Saka Buddhist kingdom located on the branch of the Silk Road that ran along the southern edge of the Taklamakan Desert in the Tarim Basin. The ancient capital was originally sited to the west of modern-day Hotan at Yotkan, from the Han dynasty until at least the Tang dynasty it was known in Chinese as Yutian. This largely Buddhist kingdom existed for over a thousand years until it was conquered by the Muslim Kara-Khanid Khanate in 1006, much of the archaeological evidence of the ancient city of Khotan however had been obliterated due to centuries of treasure hunting by local people. 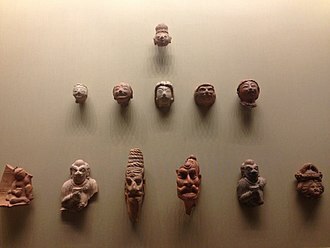 The inhabitants of Khotan used Khotanese, an Eastern Iranian language, and Gandhari Prakrit, from the 3rd century onwards they had a visible linguistic influence on the Gāndhārī language spoken at the royal court of Khotan. The Khotanese Saka language was recognized as an official court language by the 10th century. The kingdom of Khotan was given names and transcriptions. The ancient Chinese called Khotan Yutian written as 于窴 and other similar-sounding names such as Yudun, sometimes they used Jusadanna, derived from Indo-Iranian Gostan and Gostana, the names of the town and region around it, respectively. To the Tibetans in the seventh and eight centuries, the kingdom was called Li and the capital city Hu-ten, Hu-den, Hu-then and Yvu-then. The name as written by the locals changed over time, in about the third century AD, the people wrote Khotana in Kharoṣṭhī script. From this came Hvamna and Hvam in their latest texts, where Hvam kṣīra or the land of Khotan was the name given, Khotan became known to the west while the –t- was still unchanged, as is frequent in early New Persian. The local people used Gaustana under the influence of Buddhist Hybrid Sanskrit, and Yūttina in the ninth century, the geographical position of the oasis was the main factor in its success and wealth. To its north is one of the most arid and desolate desert climates on the earth, the Taklamakan Desert, to the east there were few oasis beyond Niya making travel difficult, and access is only relatively easy from the west. Buddhism was adopted in Central and Northeastern Asia from the 1st century AD, ultimately spreading to China, Japan, the Philippines and Vietnam. Alexander founded several cities in his new territories in the areas of the Amu Darya and Bactria, and Greek settlements further extended to the Khyber Pass and the Punjab region. Following Alexanders death on June 10,323 BC, the Diadochi or Successors founded their own kingdoms in Anatolia, general Seleucus set up the Seleucid Empire, which extended as far as India. Later, the part of the Seleucid Kingdom broke away to form the Greco-Bactrian Kingdom, followed by the Indo-Greek Kingdom. The interaction of Greek and Buddhist cultures operated over several centuries until it ended in the 5th century AD with the invasions of the Hephthalite Empire and the expansion of Islam. The length of the Greek presence in Central Asia and northern India provided opportunities for interaction, not only on the artistic, when Alexander invaded Bactria and Gandhara, these areas may already have been under śramanic influence, likely specifically Buddhist and Jain. 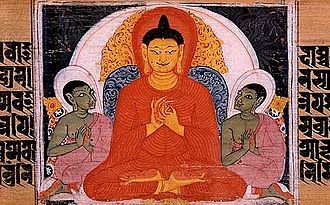 According to a legend preserved in the Pāli Canon, two merchant brothers from Kamsabhoga in Bactria and Bhallika, visited Gautama Buddha and became his disciples, the legend states that they returned home and spread the Buddhas teaching. In 326 BC, Alexander conquered the Northern region of India, King Ambhi of Taxila, known as Taxiles, surrendered his city, a notable Buddhist center, to Alexander. Alexander fought a battle against King Porus of Pauravas in the Punjab. Several philosophers, such as Pyrrho and Onesicritus, are said to have been selected by Alexander to accompany him in his eastern campaigns, during the 18 months they were in India, they were able to interact with Indian ascetics, generally described as Gymnosophists. 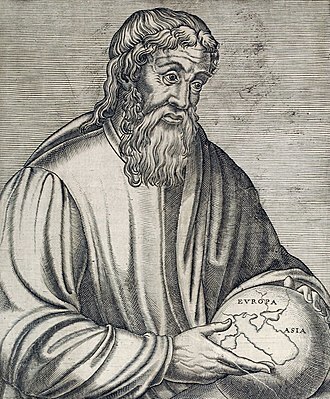 Pyrrho returned to Greece and became the first Skeptic and the founder of the school named Pyrrhonism, the Greek biographer Diogenes Laërtius explained that Pyrrhos equanimity and detachment from the world were acquired in India. Few of his sayings are known, but they are clearly reminiscent of śramanic, possibly Buddhist, Nothing really exists. That the best philosophy that which liberates the mind from pleasure, the Indian emperor Chandragupta Maurya, founder of the Maurya Empire, re-conquered around 322 BC the northwest Indian territory that had been lost to Alexander the Great. However, contacts were kept with his Greco-Iranian neighbours in the Seleucid Empire, emperor Seleucus I Nicator came to a marital agreement as part of a peace treaty, and several Greeks, such as the historian Megasthenes, resided at the Mauryan court. 58-60 The Greco-Bactrians maintained a strong Hellenistic culture at the door of India during the rule of the Maurya Empire in India, the Greco-Bactrians conquered parts of North India from 180 BC, whence they are known as the Indo-Greeks. They controlled various areas of the northern Indian territory until AD10, zarmanochegas was a śramana who, according to ancient historians such as Strabo, Cassius Dio and Nicolaus of Damascus traveled to Antioch and Athens while Augustus was ruling the Roman Empire. The coins of the Indo-Greek king Menander I, found from Afghanistan to central India, according to the Milinda Pañha, at the end of his reign Menander I became a Buddhist arhat, a fact echoed by Plutarch, who explains that his relics were shared and enshrined. 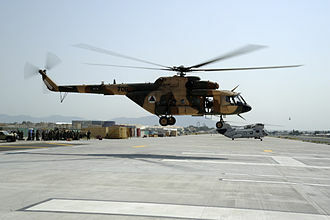 An Afghan Air Force Mi-17 helicopter comes in for a landing at Jalalabad Airport in October 2011. Arachosia, Aria and Bactria were the ancient more eastern satraps of the Achaemenid Empire that made up most of what is now Afghanistan during 500 B.C. The inhabitants of Arachosia were known as Pactyans, possibly today's Pakhtuns or Pashtuns. King Dutugemunu (161 BC – 137 BC). 2. Silver drachm of Menander I (155-130 BC). 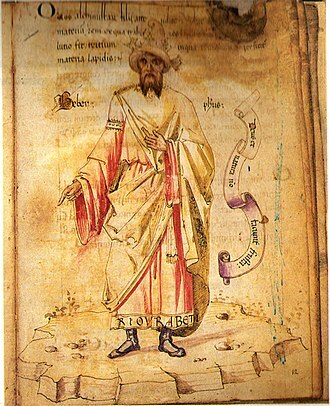 Obv: Greek legend, ΒΑΣΙΛΕΩΣ ΣΩΤΗΡΟΣ ΜΕΝΑΝΔΡΟΥ (BASILEOS SOTEROS MENANDROU) lit. "Of Saviour King Menander". Rev: Kharosthi legend: MAHARAJASA TRATARASA MENAMDRASA "Saviour King Menander". Athena advancing right, with thunderbolt and shield. Taxila mint mark. Another silver drachm of Menander I, dated circa 160-145 BC. Obverse: ΒΑΣΙΛΕΩΣ ΣΩΤΗΡΟΣ ΜΕΝΑΝΔΡΟΥ ('of King Menander the Saviour'), heroic bust of Menander, viewed from behind, head turned to left; Reverse: Athena standing right, brandishing thunderbolt and holding aegis, Karosthi legend around, monogram in field to left. Reference: Sear 7604. Bust of a bodhisattva from Kucha, 6th-7th century. Musée Guimet. Blue-eyed Central Asian monk teaching East-Asian monk, Bezeklik, Turfan, eastern Tarim Basin, China, 9th century; the monk on the right is possibly Tocharian, although more likely Sogdian. 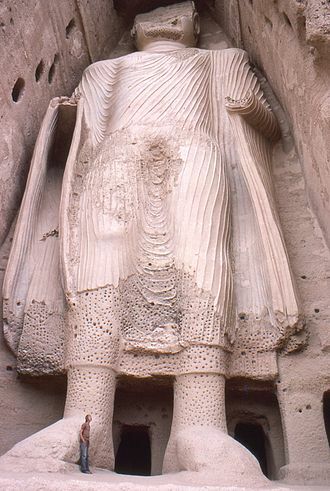 Statue of the Buddha, Mes Aynak, 3rd-6th century CE. The archeologists' camp sits beneath a monastery. The Hellenistic Pataliputra capital, discovered in Pataliputra, capital of the Maurya Empire, dated to the 3rd century BC. A coin of Menander I (r.160–135 BC) with a dharmacakra and a palm. Footprint of the Buddha. 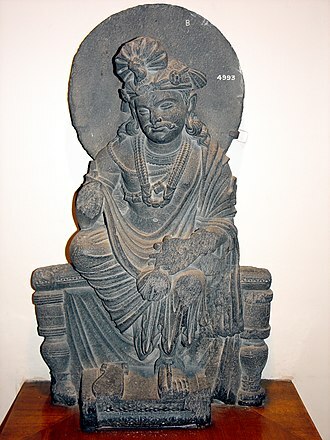 1st century BCE, Gandhara.